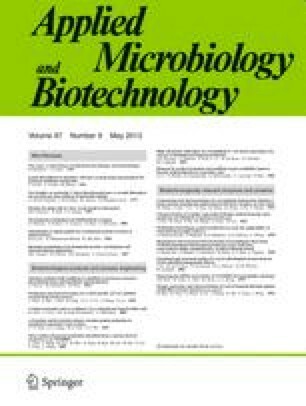 An agar plate-clearing assay was used to screen 37 thermophilic actinomycete strains for extracellular xylanase production. The xylanase activity in culture supernatants of strains representing Saccharomonospora viridis and three Thermomonospora spp. was characterised by measurement of reducing sugar released from oat spelt xylan and analysis of degradation products by thin-layer chromatography. In all four species, xylanase activity was optimal within the temperature range 60–75°C and between pH 5 and pH 8. While culture supernatants of Thermomonospora strains incubated at 70°C for 60 min retained >80% of their activity, that of S. viridis was almost, totally inactivated. All of the culture supernatants initially hydrolysed xylan to a mixture of oligomeric products, indicating that the main activity was of the endoxylanase type. Prolonged incubation for 24h resulted in the hydrolysis of xylan to d-xylose by T curvata and T. fusca preparations, indicating the additional presence of exoxylanase or β-xylosidase activity. Xylanase production was induced by growth on xylan although low levels of activity were also detected in glucose-grown cultures. Thermomonospora curvata MT815 culture supernatant was the most active and produced d-xylose from milled wheat straw in yields approximately 10% of those from oat spelt xylan.